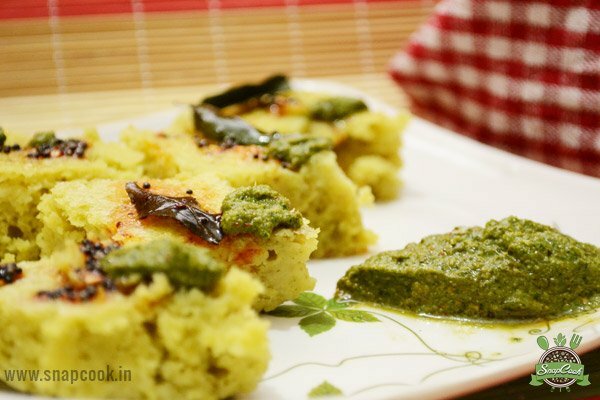 Dal Dhokla is a healthy snack which is very nutritious and protein-rich diet. It is easy to make and low in fat recipe. It is a perfect travel or lunch box companion. Soak all dals in plenty of water for about 6 hours. Add the soda, oil, salt, ginger & green chilli paste and mix well. Grease dhokla thali( flat metal with low rim) with the oil. Pour enough batter so as to fill half the height of the thali. Place the dhokla plate in a steamer and steam for about 10-15 minutes on low flame, until the dhokla’s are cooked. For seasoning, heat oil in a small frying pan and add the mustard seeds and curry leaves. Once the crackle, turn of heat and add lemon juice to it. Now drizzle the seasoning over the dhokla’s. Cut into desired shape and serve with chutney. You can make these dhokla’s more nutritious by adding vegetables of your choice like finely chopped carrots, french beans, grated bottled gourd, green peas, finely chopped cabbage to the batter before steaming. You can add boiled and grinded spinach (palak) also.